North Star African Violet Council Twin Cities: Rob's 'Slap Happy' African violet! 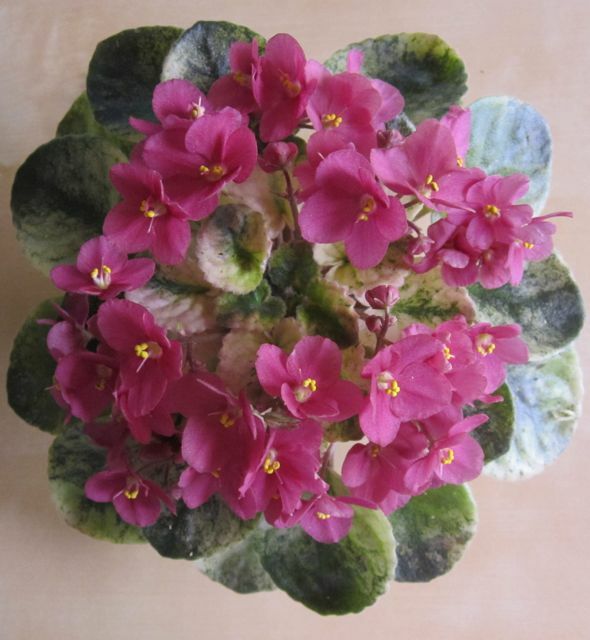 Rob's 'Slap Happy' African violet! WHOOPS! I finally get a nearly perfect violet, in glorious bloom and in technicolor too and it's one month and two days till the spring show. The next time you are at a flower show, whether violet or other flowers, remember that it takes quite a lot of planning and not just a little talent to get the entries to the show looking fresh and magnificent and like they just came out of a painting. I get to tip my hat once again to the rest of my club's members that have the skills I still lack in planning and timing. Sometimes the plant just defies all your best efforts, but I think I better study up on my "efforts". Remember, to see things like (but NOT) this one, the show starts April 1, 2011!